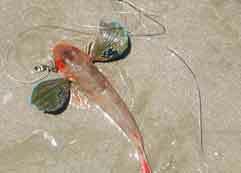 If you are new to this site this is Pauls Fishing Kites fishing report page. We post all new fishing reports here once or twice a month depending on how many reports we receive. Just a note to tell you about the fun I have had with the Rod and Reel Kitefishing Rig I bought from you in December. I arrived at the shop with my partner Steve Barnes, who has recently caught some very large fish and made it into the fishing reports and Fishing News Magazine. "My aim" I told Rob, "was that as a woman I wanted to catch my own fish, not just watch and help Steve". The boys seemed a little amused at my request but very kindly obliged by selling me my very own Rod and Reel with 800 meters of braid, a flexiwing kite, and dropper rig. So, I was ready for our Far North holiday in January. We travelled around chasing the off shore winds from Doubtless Bay to 90 Mile Beach, catching enough snapper and gurnard to eat along the way. It did not take me long to learn how to use the system successfully and in no time at all I could outfish the man just by sitting on my new chillybin. 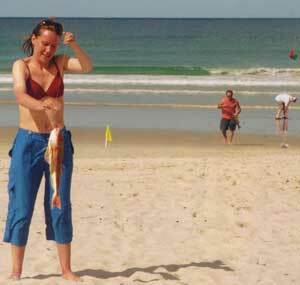 Photo Right : We took some photo's of our fishing at 90 Mile beach in January. I caught the snapper and kahawai on an outgoing tide using kahawaii and squid for bait. The line was out about 400 meters offshore. Photo below : Then I realised something big was on when the flag and bottle started moving up the beach. Fresh kahawai was used to catch this large shark which was then returned back to the water... much to the shock of the swimmers on the beach. Please give my thanks to the 'Boys' in the Shop for helping a 'Lady' to achieve her goal of competing with the guys and catching fish too. We drove up Murawai yesterday about 7 kilometers past Rimmers Rd in the late afternoon. 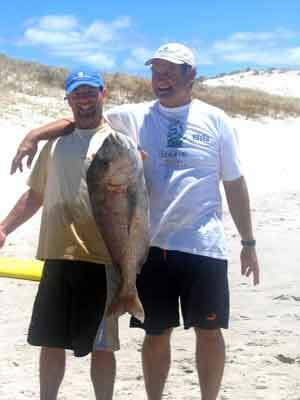 It was an outgoing tide and we fished with a 65kg dropper rig baited with mullet. 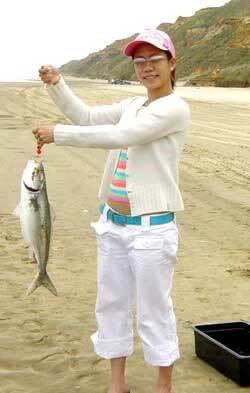 We fished two sets. 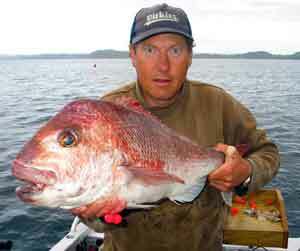 The 6.5 kg snapper in the picture was caught on the first set, the second set returned with three average sized snapper and three kahawai. We got off the beach just before dark. While camping at Muriwai on January 29th, we had ideal offshore winds. Baiting up our large dropper rig with frozen mullet and running just 10 hooks per set, we let the gear run out to around 600 metres offshore. The gear went straight out, conditions were perfect for kitefishing. We ran four sets on the day and wound up with a total of 12 snapper, all ranging from 40 to 45cm in length, and six large gurnard. We didn't catch any kahawai and had no problems with sharks on the day. Interestingly, the inshore surf zone was boiling with kahawai activity in the evening. Surfcasters in the late afternoon and into the evening were casting their lines to just 30 feet offshore and hauling in some huge ocean going kahawai on the three quarter rising tide. 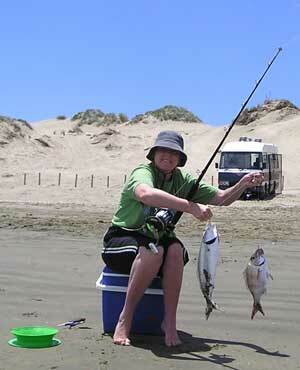 Right : Petra sorts out a gurnard while Aaron brings a good snapper up the beach on a recent trip to Te Arai Point. 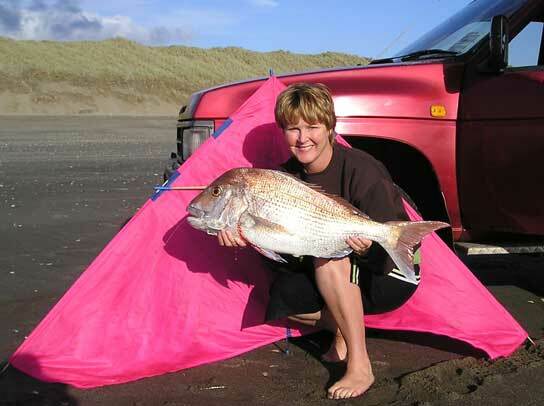 The winds have been great for the west coast for quite some time and kitefishers here in the far north have been catching plenty of school size snapper. 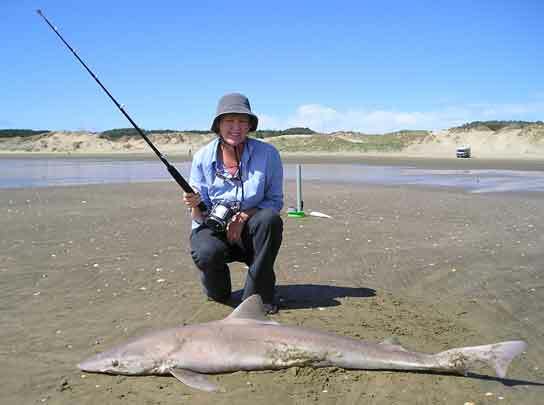 Photo Right : My grandson, Eathen, taken while kitefishing with our bottom longline kite rig at Dargaville on December 29th. There was a strong North East wind blowing and the gear went out without any problems. We wound up with 9 good pan sized snapper for the day. As of late January, the northeasterlies are still blowing and the kitefishers and surfcasters are catching great hauls of snapper and gurnard. On Sunday 30/01/05 my partner Theresa, my father, Barney Campbell and myself had an early start and arrived at Mahuta Gap in Dargaville at 5.15am. The tide was most of the way out and there was a good 15-20 knot southeasterly blowing. We did three sets baited with squid, salted bonito and fresh kahawai using the Flexiwing dropper rig with 5/0 snapper target hooks and floating beads. 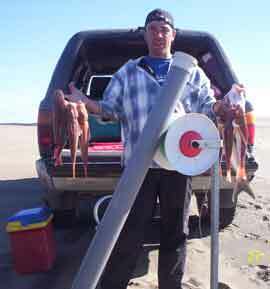 The Flexiwing rig had no problems handling the west coast. All sets caught fish with the gear being set to around 700 meters out. In total we got six snapper, two gurnard, one nice sized trevally, and two kahawai. 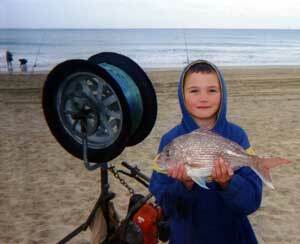 One of the kahawai we caught was used for bait and this resulted in good catches of snapper. 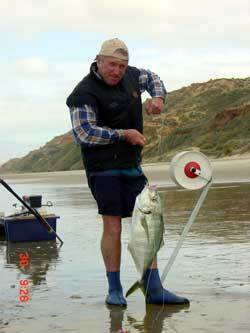 Yesterday I went fishing up Muriwai Beach with my Flexi-wing and Penn 6/0 combo I purchased off you before Christmas. I had quite a bit of trouble getting the hooks out past the breakers. I was using your roller with two weights, a piece of pvc over the top of it, and no bottle. It seemed to be getting stuck at about the back of the breakers, probably in a hole I suspect. The surf was quite big and the wind was probably 10-15 Knots. I went the roller way because I thought the surf too big to get a bottle out with the wind available. I even tried moving up the beach to a spot that looked more even, but the problem seemed to be at the back of the breakers where it was too hard to judge what the bottom was like. Can you suggest a solution? On a positive note, eventually, with the help of a black cloud and some more wind, I managed to get the line out 800 metres or so and caught two snapper. I was most impressed with how much braid (all 800m) I could get out of the water. Ed : If you were at the southern end of Muriwai it is possible that you were snagging the small mat mussels that grow in clumps just offshore. Usually a gust of wind is enough to dislodge the mussels and the gear will set freely once it clears the surf zone. In light winds those fishing the southern end of Muriwai Beach with small kites like the flexiwing are probably better off using a lightly weighted bottle and hook section. We were tired of people saying "lets not use the setline today, take rods only" so my mate and I left the rods behind and just took the boat longline. We left the ramp at 7.45am and were back at 9 am. Frozen mullet was the best bait on hand and we only got one fish, this 10lb growler. All my traces have target snapper hooks and double floats to keep the hooks away from rocks, crabs and star fish. We caught this lot on one set of our bottom longline kite rig. 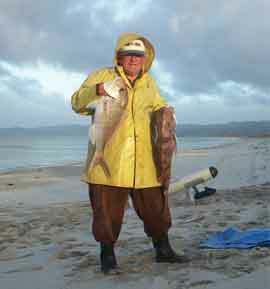 Photo Below : Here is a happy chappy who will be eating fresh snapper. Time to crack another cold one and celebrate another successful set of our fishing submarine! Hi all, I have attached a photo of a 6kg snapper that my husband and father caught the first time they ever went contiki fishing. The fish was caught off Waipu Cove along with a few gurnard. Photo Right : Rodger Folkard (left) of Auckland and Father In Law Ross Field (right) of Waipu Cove. My thanks to you Paul Peggy and Rob for your assistance with information on kite fishing. I have been a devotee for 12 years now and have moved out of Auckland to the far North. I am now based in Kaimaumau, it's handy to both west and east coast beaches. AWWSOME life up here. Again thanks for the updates and the kitefishing news. I bought some super braid not knowing that it takes special knots. As I tested my knots, I was getting rather disappointing failures. Then I found your site and the "braided loop knot". Got a perfect tie the first time and get a better than 70% knot. Very encouraging. Then I tried tying the braid to an equal strength mono. None of the knots I tried held, so I just tied a braided loop in both and "cats pawed" them together. With a regular "cats paw" the braid cuts the mono at about 50%. And am guessing that this joint would probably degrade over time since the braid pinches the mono. To cut a long story short, I found a simple solution. Doubled the "cats paw". This is of course twice as wide as regular "cats paw" and has lower pinch stress. This joint holds in the 70% range. I haven't seen this solution anywere and since I got the "braided loop knot", that first got me on the road to successful super braid knots from you, I thought I might share the "double cats paw" idea with you. I like the way your knots are illustrated. It is easy to figure out what is going on. Ed : I think a spectra tail end covered by the dacron sleeve granny knot will also spread the load at the catspaw and may be stronger for attaching spectra to nylon. There were three other models on the beach and our new Powertiki was the only one that went out straight in the three metre surf. I just pointed the Powertiki straight ahead and flicked the switch. It is just too easy! I was amazed at how fast it powered through the surf and how well it stays on track. I was even more impressed when we pulled it in with a nice haul of snapper, the biggest was 17 lbs! It was the first time we used the Powertiki. The sea was very rough and I didn't think we would get it out because of the big waves. I decided to give it a go anyway. I launched the Powertiki and was astounded, I just stood there with my mouth open watching it power through the surf. We lost sight of it for a while with all the white water. When we caught sight of it again it was well clear of the surf heading straight out at 90 degrees to the beach. It was great because we got our baits out exactly where we wanted them. An electric kontiki has been found and will be returned to the owner if he can convince the finder that it is his. If you wish to claim the electric kontiki simply contact us. Please include the make and model of your lost electric kontiki and provide details of where it was lost, how it was lost and any indentifying marks etc. If your information coincides with the information on the found kontiki you will be contacted to arrange the return of it. Don't forget to include your correct phone number and/or email address so we can contact you. Don't forget to take your camera when you go fishing and send in some pics and a report.